A musical family of Libbie Noakes and her two daughters, Emma Louise Burton and Jenny Noakes, entertained a small but appreciative audience at Capel Bach, Trefin, Pembrokeshire on 22nd December. The trio were accompanied by Julian Harries on the keyboard. The two sopranos, Emma and Jenny, who trained in opera and musical theatre respectively travelled from Hampshire to join their mother, mezzo soprano Libbie, for the special festive concert. The Christmas themed programme of carols and old favourite songs, three days before Christmas was in aid of Prostate Cymru. The programme included O Holy Night, Ave Maria, Silent Night, Have Yourself A Merry Little Christmas and Let It Snow. Pre-concert drinks and canapés were enjoyed at the nearby Ship Inn and Christmas ice cream was served after the event, kindly donated by Lochmeyler Farm Ice Cream. The charity is very close to the family’s hearts due to friends and members of the local community having been affected by prostate diseases. A big thank you goes to all, including lead sponsors St Davids Food & Wine, who supported this event which raised a grand total of £225. 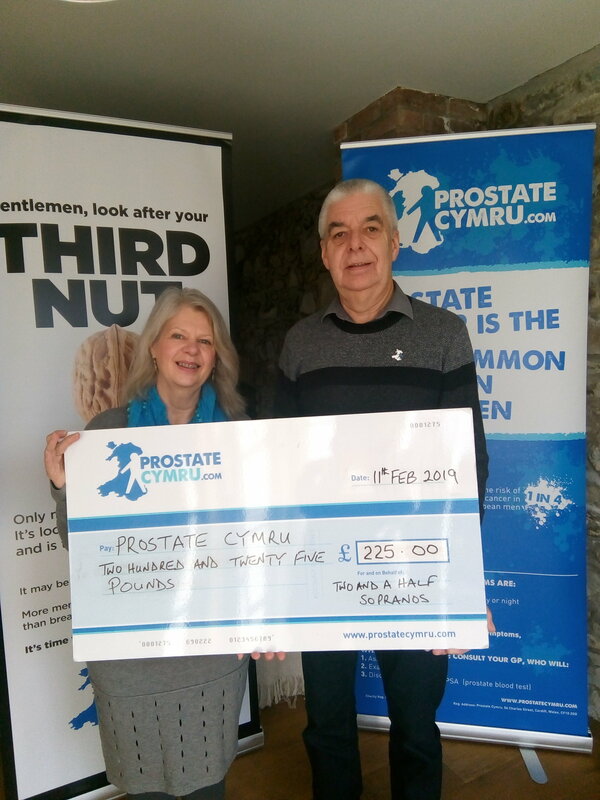 Pictured : Libbie Noakes presents the cheque for £225 to John Williams, Secretary of the Pembrokeshire Friends of Prostate Cymru group.